John Esh is an award-winning 2002 BFA grad. Twice he has won top honors at Gen Con. He recalls that it was in Joe Lacey’s Illustration class that he first learned of the Gen Con art show. Gen Con bills itself as,”the original, longest running, best attended, gaming convention in the world. 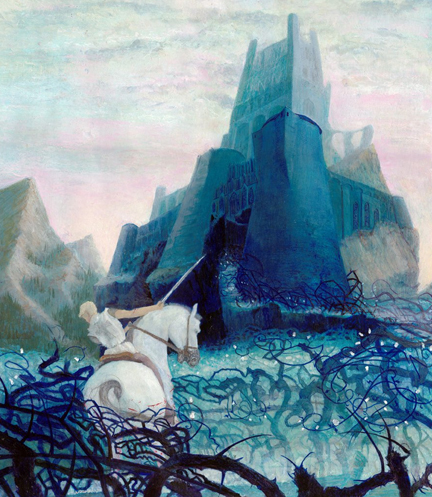 The Gen Con Art Show is the premiere showcase for fantasy, sci-fi, horror, and gaming art. ” The attendance for the event in Indianapolis topped 36,000 in 2011. 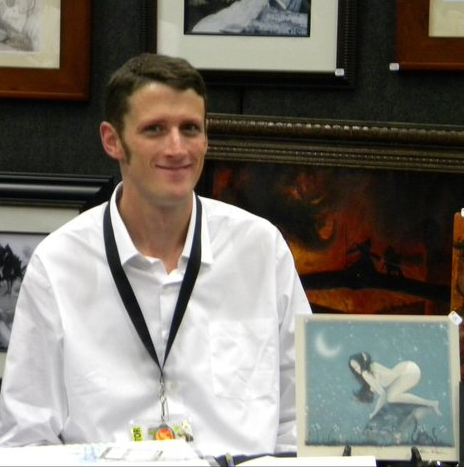 John Esh’s artwork, pictured above, was singled out for a blue ribbon and one of the highest awards at the recent convention. His oil painting, Sleeping Beauty, was awarded the Juror’s Choice Blue Ribbon by Jeff Miracola, Artist Guest of Honor. Miracola is a well-respected illustrator whose clients include Wizards of the Coast, Hasbro, and Advanced Photoshop Magazine. Sleeping Beauty was produced by painting thin oil paint glazes on illustration board, a technique John learned from the fantasy artist Donato Giancola when he visited Kutztown’s illustration classes. 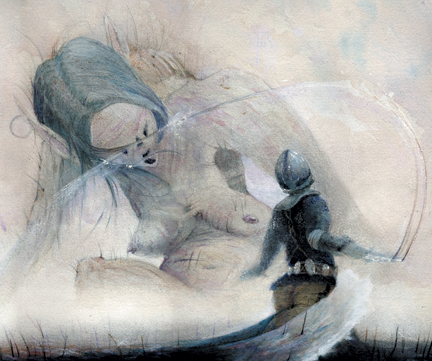 John also attended Gen Con in 2005 and won that year’s Juror’s Choice Prize for a watercolor based on the Beowulf saga from guest juror, Jeremy Canford. Canford was art director for Wizards of the Coast, responsible for Magic the Gathering and the Dungeon’s & Dragons gaming franchises. John recalls that the Beowulf painting was originally produced for Prof. Martin Lemelman’s senior illustration class at Kutztown. By the way, Martin Lemelman has his own illustrated blog at http://www.twocentcomics.com. John Esh thinks of himself as himself a “fantasy fine artist,” since he doesn’t work in the gaming industry as an illustrator. He enjoys the freedom to choose his subject matter and sell high-quality prints based on his original artwork. Anyone interested in his artwork is welcome to contact John Esh via email: artmanesh@gmail.com. Congrats to John on his well-deserved success. Hopefully, he will keep us posted about future exhibitions and awards. Note: The Illustration Concentration Blog has had over 30,000 hits in the past year. Thanks for reading. If you are an illustrator, especially one with a Kutztown connection, please don’t be shy. Keep us informed about your success! < Previous Ashley, How did you get that great job? Next > KUTZTOWN, Where the Wild Things Are! Does John have a presence online? I loved his work, but I wasn’t able to find it once I left Gen Con. Hi there, My name is Joseph Esh and Im an artist in arizona. Wonder if we are related?